French Guiana’s January carnival is normally a fun and festive occasion. But this year, a young man was severely beaten by ten other teenagers during the procession, marring the celebrations. The violence prompted Cayenne’s mayor to forbid anyone who was not in costume to participate in the carnival. Despite lying 7,000km away from Paris on the East coast of South America, French Guiana is classified as a part of France. It is known as an overseas “department” and sends representatives to the French parliament. Violence at the carnival is only the tip of the iceberg. French Guiana has been declared France’s “deadliest department“, where violence has been on the rise since the late 2000s, especially in the capital city Cayenne. 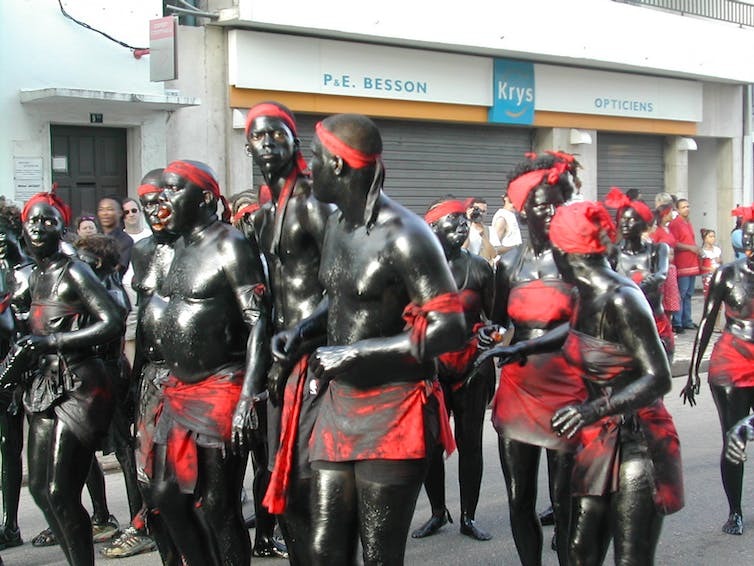 A group of Neg’marrons participate in the French Guiana’s annual carnival. According to the United Nations, in 2009, the annual murder rate of French Guiana was 13.3 per 100,000 inhabitants, compared to 1.1 in mainland France, and 2.7 and 7.9 in Martinique and Guadeloupe, two other overseas French departments. These violent episodes have psychological and historical causes, relating to the history of French Guiana and its ongoing identity issues. Guiana: a genesis of violence? Violence is familiar to all cultures but it has its own genesis in French Guiana. The history of this region is punctuated by significantly violent episodes. A popular outlet par excellence, the annual carnival highlights are the troupes of Neg’marrons who pose as rebel slaves intimidating the spectators. There are also people dressed as convicts and Senegalese riflemen. All appeal to a transgressive collective memory. 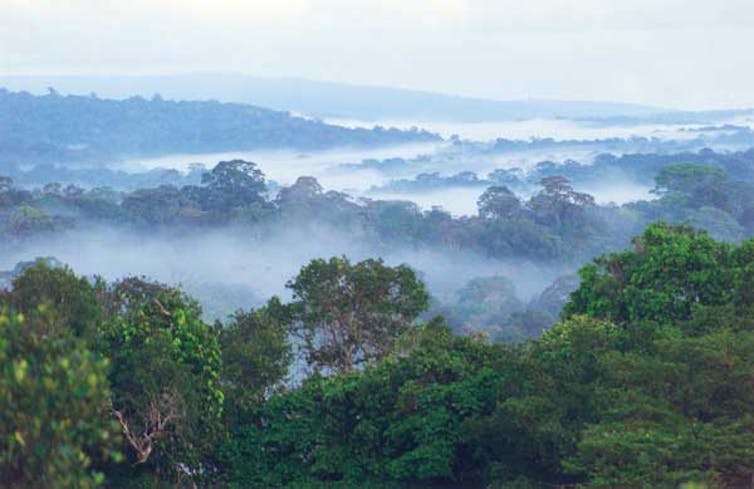 A prized paradise destination for tourists, Guiana is also the most violent French department. Belonging to the French since 1643, French Guiana was born from a singular colonial context. Unlike in the West Indies, the Amerindians of French Guiana survived their encounter with Europeans. They passed on the memory of colonisation through the myth of the Pailanti’po. In this legend, a monster devouring the Amerindians acts as a personification of the deadly diseases that appeared along with the European colonisers. French Guiana’s history is also one of slavery and racism. For two centuries, mistreatment from slave masters was answered by the resistance of rebel slaves, or Maroons, violence was both physical and spiritual. As a response to slavery, characters such as the sorcerer poisoner assumed a major role among the three Indigenous peoples of French Guiana. The position of the sorcerer poisoner, a diviner and witch doctor, which finds its origins in African societies, is known as the Piaye among native Amerindians, the Obeah Man among the Bushinengués of the Maroni, and the Gado among the Creoles. The end of slavery in 1848 did not end the relationship between masters and slaves – it was instead prolonged through the forced commitment of contract workers. This meant that violence remained a regular feature in collective memory. It can be seen in the figure of the notorious Gabonese contract worker turned criminal D’Chimbo. D’Chimbo spread terror on the island of Cayenne through his brutal machete attacks from 1860 to 1862, but has been remembered as a hero for fighting the colonial system. At that time, the plantation economy had already been replaced by slash and burn agriculture. The gold rush led to massive acquisition of rifles, turning Guyanese forests into lawless zones. Off the coast, the penitentiary nicknamed Devil’s Island opened in 1852 and transformed Guiana over the following century into a convict colony, as portrayed in the 1973 film, Papillon. Its most famous resident was Alfred Dreyfus, the victim of the notorious Dreyfus affair. ‘In the land of the Old Whites’, a 1963 documentary on the inhumane conditions of convicts sent to French Guiana. French Guiana’s history has been based on conflict between slaves and masters, whites and blacks, the weak and the powerful. To what extent does this explain the current violence? Periodic eruptions of violence underline the ambiguity of the relationship with the mainland. Cayenne experienced riots in 1928 because of electoral fraud, the 1946 revolt of the Senegalese riflemen who had settled in French Guiana to assist the local forces, and finally the nationalist push in the late 1960s whose proponents claimed more independence from France and rejected its politics. Guiana nationalist film on the political context of the early 1970s. Adding to the weight of this tumultuous past are the paradoxes of a South American territory being integrated in the European Union. Since the departmentalisation of 1946, which made French Guiana an overseas territory of France, migration has deeply reshaped Guianese society. Two out of three adults are not born in Guiana: they are from the French continent or other overseas territories, or perhaps Brazilian, Surinamese, Haitian or Chinese. The population of roughly 250,000 is expected to double again by 2040. At the forefront of the concerns of the Guianese authorities is the future of the 10,000 children aged between six and 16 who are today left out of the educational system. This poses a challenging problem for the President of the Central Office for Cooperation at School of Guiana who has said, “education must be a true lightning rod against this violence”. Community division threatens the society. Creoles and mainlanders monopolise political and economic power in contrast with the more recently arrived groups. Now a minority, some members of Creole society sometimes aggressively reassert their identity. The latest arrivals are those of the Haitians in 1975 who became even more numerous after the 2010 earthquake and Hurricane Matthew of 2016. French Guiana, by its geography, is close to countries where some criminal systems thrive, and in which the violence is trivialised (racket, drug trafficking). The challenges posed by this South American settings add to the already tormented Guianese society. Strong economic growth has failed to reduce ever-growing poverty, with unemployment affecting one out of every two young people. Plush villas and private swimming pools neighbour Haitian slums. The frustration borne from the inequalities associated with the traditional free flow of arms constitute the breeding ground for the daily violence. Added to the illegal gold mining and cocaine trafficking are the ever-present robberies, despite an extensive mobilisation of public authorities.